This tour highlights the beautiful nature and traditional life between the sea and the lagoon and the Gold of the Baltic. Start with a visit to the lagoon port of Wustrow. It smells of fresh smoked fish and you can get a closer look at the specifics of the “Bodden” (lagoon). 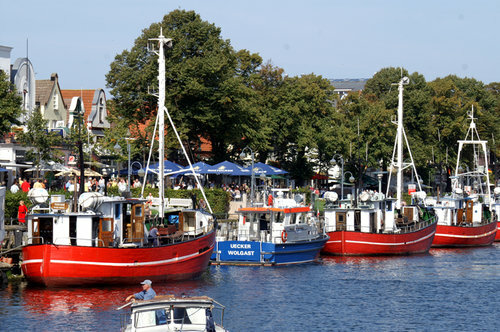 In Ahrenshoop enjoy the beautiful view from the steep coast toward the Baltic Sea and discover the authentic motifs which have already inspired the painters of the 19th century. Special highlights are the art & craft shop “Bunte Stube” from the 1920s and the unusual, small “Schifferkirche” church from the 1950s. Driving through the village Born you will see a lot of the typical, thatched homes with the colorful, carved doors. Make sure you also pay a visit to the old seamen’s church of Prerow with its preserved headstones. In the nearby seaside resort of Zingst you will have the opportunity to take a stroll on the beach promenade and taste some local specialties. In the afternoon return to Rostock via the mainland along the southern coast of the chain of lagoons and stop for an inside visit at the fascinating German Amber Museum in Ribnitz, settled in an old convent.